Our customers can avail from us, a broad range of Shopping Basket, which can be used in numerous ways mainly in supermarkets etc. 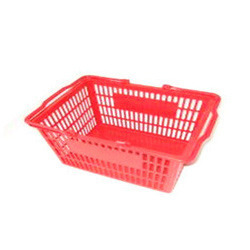 These Shopping Baskets are manufactured using high quality raw stuff, which are being sourced from trustworthy vendors. Our products are strong construction and dimensionally accurate. We offer this product at competitive price to our customers. Established in the year 2013 at Mumbai, we, BND Product Solutions, are a leading Manufacturer, Supplier, Exporter, Trader and Importer of premium-quality Furniture for Preschool and Retail Outlets. Our range of furniture is highly demanded by retail companies, kindergartens and playschools. The products supplied by us are tailor-made as per the client’s requirements. The range of pre school furniture manufactured by us is designed in such a manner that it is completely safe for kids. The products in this range do not have sharp edges, heavy weight or tall height in order to prevent accidental injuries being caused to children. Racks supplied to retail outlets enable them to efficiently display their products to prospective buyers.Wood and metal happen to be the most commonly used materials for the construction of furniture, unless otherwise specified by the clients. Our products are aesthetically appealing and enhance the decor of the interiors, besides serving utilitarian purposes.